Hail is dangerous and Auto hail damage can be as well. When your car is in the middle of a hail storm, it can take on a lot of damage. This can result in various parts becoming unusable, making it difficult to drive. When this happens, you are going to need auto hail damage repair. This can help you to reverse the effects of the hail so that your vehicle is in top condition. This is important considering how severe the damage can be. You should not allow your vehicle to just sit with dents, broken pieces, and unusable parts. Automotive hail damage does not have to stop you if you get the proper repairs done. 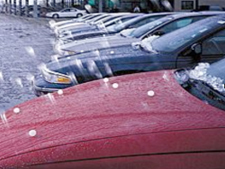 Car hail damage occurs after a hail storm. This storm does not have to be heavy, but it usually has larger hail stones. These stones will crash down upon your car, breaking the glass (windscreen, sunroof, mirrors, etc.) and leaving large dents. Sometimes, they may hit sensitive areas of the vehicle that affect the way that it runs or works in general. This can make it hard or impossible for you to drive, which is something that you have to fix immediately. This type of damage is not going to just go away over time. If this happens to you, make sure that you reach out to a repair shop as soon as you can. Failing to reach out for help when you have vehicle hail damage can become costly. The longer that you wait, the worse that this can become. Your vehicle will remain exposed and will likely worsen over time. This is especially true in situations where the interior or the engine is exposed due to damage. If it rains, as an example, your repair bill is going to go up because of water damage. Even if you cover it or the damage has not led to exposure, this is still dangerous. Your vehicle is not in top condition and it is not as reliable as it should be. If the damage worsens at any point, you are going to have to pay even more than you would have for auto hail damage alone. Automotive hail damage repair is not difficult to find. You are already on the World Hail Network site which contains answers to most questions, lists of repair vendors and more. You can also check with local body shops and PDR shops that will be able to help you with this and give you reliable information and work. This can help you to reverse the damage and bring your vehicle back to life. Since areas where hail is regular deal with this all of the time, there is a large amount of information with shops. This ensures that the job is done by people who know what they are doing. Your car hail damage will be repaired and will not even be noticeable afterwards. When the vehicle hail damage is gone, you can go back to enjoying your car. You should not see any signs of the damage in appearance or function. This allows you to continue using your car without anything getting in the way. You can count on it to work for you when you need transportation, regardless of the severity of the auto hail damage. Read about the next term: Auto Hail Repair – The process of repairing or replacing any materials damaged by a hail storm.